Help us bring the world’s digital government conversation to Canada. Each year, the best minds in government and technology converge on Ottawa to chart the course of technology and society. And each year, a select group of supporters help us make this happen. Government is data. Code is law. And no industry is more transformed by technology than government itself. Governments, spurred by citizen demand, have a strong mandate to deliver digital services. Clearly explaining how to get to a digital future delivers on the expectations of citizens; streamlines the delivery efforts of public servants; and helps vendors sell products. In other words, improving the understanding and removing the risk of technology is good for everyone, and worth supporting. That’s why many of our top supporters continue to back the event. They want to raise the tide. One vendor told us of an event where they collected nearly 5,000 leads, but none were qualified. Another bemoaned the fact that every government employee’s email is publicly available—but they continue to collect opt-in email addresses. And a third told us that with expo halls and badge-swapping, they simply spent the day handing out trinkets rather than building relationships. This will not stand. There are better ways to create dialogues. They’re more work for sponsors, who have to bring their “A” game and create fascinating, useful content from top-tier speakers. And they’re less lucrative for event organizers, who have a finite number of sponsorship opportunities to offer. But they’re the right thing to do. That’s why we don’t have an “expo hall,” and work closely with all sponsors to ensure they have superb content that attracts attention from the audience. Presentations and panels can be a great way to deliver ideas at scale. But there’s no substitute for genuine conversations. One-on-one discussions that identify real needs, concrete timelines, and known obstacles yield the best results. It’s also clear that a conference has to be a dialogue, with industry explaining trends and sharing lessons learned in the private sector, and public sector leaders sharing their challenges, successes, and case studies. That’s why we have extensive networking initiatives, including the innovative Circlesquare format, networking, and a range of supporting events. It’s why we have both government and industry on stage. And it’s why hundreds of attendees from the private sector join us every year for insight and interaction. Nothing is purely public- or private-sector. Governments have unique needs and constraints; but industry has widespread adoption and insight into what works at scale. The best solutions combine both public- and private-sector elements, while clearly setting expectations and encouraging iterative deployments and transparency. That’s why we have an Industry Innovations track to showcase vital changes in commercial technology, and how it’s being put to work in municipal, state, provincial and federal governments worldwide. The digital government conversation doesn’t end at the borders. From the outset, people wanted a global event that brought many countries together. In 2017, FWD50 included the participation of six nations; in early 2018, partly as a result of those conversations, Canada joined the D7 group of digital nations. 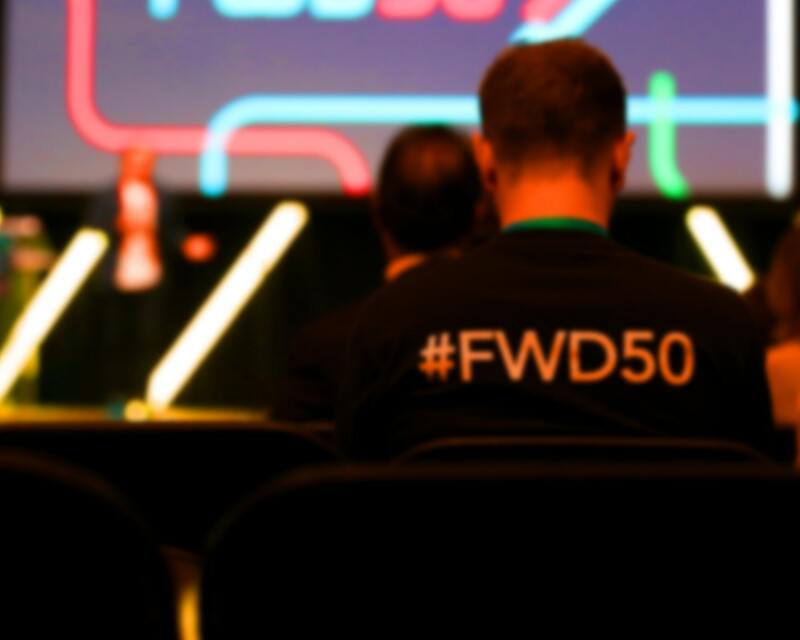 That’s why this year’s diverse lineup pulls in participants from over a dozen countries, and makes FWD50 a global event happening in Canada rather than a Canadian event. Join some of the world’s most innovative technology companies in supporting this year’s event. We’re trying to build a better conference for all involved, and taking serious risks to focus on quality interactions with the right partners. If you agree with us, please contact us for a prospectus.